Extremely high blood pressure is determined by the parameters 180/120 mm Hg. Art. and above. This condition can lead to damage to the blood vessels. Also, at such high blood pressure, the heart can not effectively pump blood. For these reasons, it is important to immediately seek medical help to reduce the risk of stroke and other cardiovascular complications. Hypertensive crisis (GK) is a rapid and serious increase in blood pressure, which can lead to stroke or myocardial infarction. The pathological condition is most often the major complication of hypertension, although in some cases it develops suddenly without any preceding symptoms. The most common clinical manifestations of hypertension are: cerebral stroke (24.5%), pulmonary edema (22.5%), hypertonic encephalopathy (16.3%), and congestive heart failure (12%). Less commonly, intracranial hemorrhage, aortic rupture and eclampsia develop [1 - "Pathophysiology".Retrieved 20/04/2010]. The hypertensive crisis is most often determined by ambulance, although during a prolonged course of the illness the patient could have had abrupt rise in blood pressure. In such cases, the clinic could be removed by prescription drugs prescribed by the doctor. In any case, special attention is required to the condition of the patient and a thorough examination of all organs and systems of the body. Video What is a hypertensive crisis? The hypertensive crisis covers a whole spectrum of clinical manifestations characterized by non-controllably high blood pressure, leading to progressive or impending organ dysfunction. Under these conditions it is necessary to reduce the blood pressure for the maximum allowed time. Neurological damage to target organs against high blood pressure may include hypertonic encephalopathy, cerebral ischemia or stroke, subarachnoid hemorrhage and / or intracranial hemorrhage. 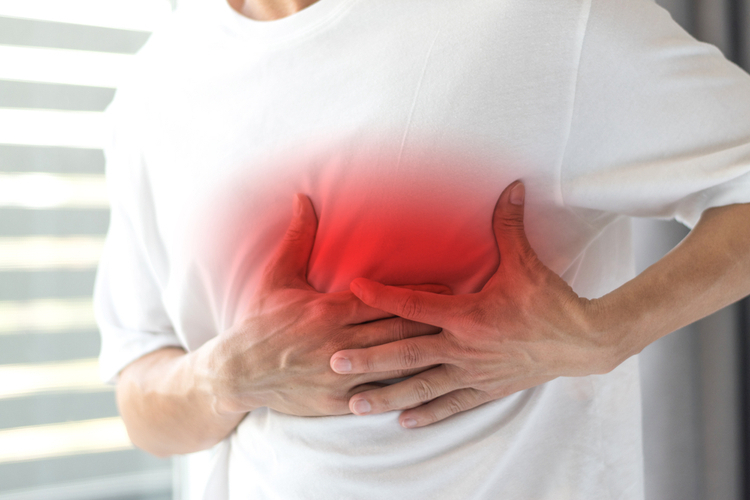 Cardiovascular organ damage may include myocardial ischemia / myocardial infarction, acute left ventricular dysfunction, acute pulmonary edema and / or rupture of the aorta. Other systems of organs can also affect the GC, which can lead to acute renal failure, retinopathy, eclampsia or microangiopathic hemolytic anemia. the appearance or strengthening of signs on the part of target organs. In addition, autonomic nervous system disorders may appear or intensify. 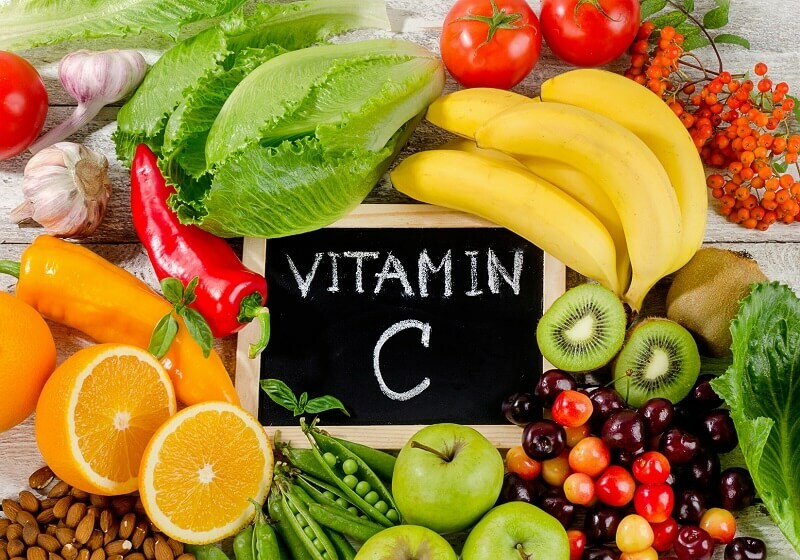 With the correct course of treatment, successful prevention of GC can be performed, as well as improve the prognostic conclusion for the underlying disease. There is such a designation of the GC as "complicated hypertonic crisis," which was formerly called "malignant hypertension". Its development is often associated with direct damage to one or more organs, and there must be evidence of such violations. Also, the term "critical arterial hypertension" is more common in the US and Canada. Complicated GC-defining symptoms of damage to target organs. The hypertensive crisis affects 500,000 Americans each year and is therefore the cause of serious morbidity in the United States. Approximately 50 million adults have hypertension, of which the fraction of hypertensive crisis accounts for less than 1% per year. About 14% of adults who were in emergency departments in US hospitals had systolic blood pressure ≥180 mm Hg. As a result of the use of antihypertensive drugs, the level of hypertension decreased from 7% to 1% of people with high blood pressure. Also increased survival for 1 year. By 1950 this figure was 20%, and now more than 90% with proper treatment. Statistics show that approximately 1% to 2% of people with hypertension are experiencing a hypertensive crisis at some point in their life. Men are more likely to suffer from hypertensive crises than women. Hospitalization due to the development of hypertensive crisis has tripled since 1983 to 1990, from 23,000 to 73,000 / year in the United States. The frequency of postoperative hypertensive crisis varies, however, in most studies, the incidence is reported from 4% to 35%. Mortality from the GC worldwide is 50-75%, while the percentage depends on the development of medical care in a particular country. In pregnant patients, a hypertensive crisis is usually a consequence of hypertension or severe pre-eclampsia and can lead to maternal stroke, cardiac-pulmonary decompensation, fetal decompensation caused by reduced uterine perfusion, breakdown and stillbirth. Preeclampsia may also be complicated by pulmonary edema. Other symptoms of a hypertensive crisis may be blurred vision, nausea or vomiting, dizziness or weakness, as well as thinking, sleep, and behavioral changes. Cerebral infarction (24.5%) is a faint, and after coming to the consciousness of a patient, he may complain of back pain. Pulmonary edema (22.5%) is hoarseness, choking, frequent breathing, pronounced sweating, fear of death. Hypertensive encephalopathy (16.3%) - nausea and vomiting, anxiety, headache, dizziness and convulsions. Congestive heart failure (12%) - weakness, shortness of breath and palpitation, cyanotic skin and mucous membranes, swelling on the legs. Other clinical manifestations associated with hypertensive crises may include intracranial hemorrhage, aortic rupture, and eclampsia, as well as acute myocardial infarction and damage to the retina and kidneys. is associated with pulmonary edema or congestive heart failure. Neurological syndrome may manifest itself as convulsions, visual disturbances and altered levels of consciousness. The presence of such symptoms most often indicates hypertonic encephalopathy. The pathological symptom of a malignant GC is fibrinoid necrosis of the arterioles, which is characterized by systemic development, but most often affects the kidneys. These patients develop fatal complications and, if left untreated, more than 90% die within 1-2 years. Gathering the history of the disease and physical examination allow to determine the nature, severity and degree of controllability of hypertensive crisis. The history of the disease can be focused on the presence of target organ dysfunction, circumstances associated with hypertension, and any identifiable etiology. During the diagnosis of GC, the duration and severity of previous BP elevations in the patient (including the degree of BP control), as well as the history of treatment, are evaluated. Details of antihypertensive drug therapy, taking medications (sympathomimetic agents) and the use of illicit drugs (cocaine) are important elements of the history of treatment. In addition, information should be provided on the presence of prior dysfunction of target organs, especially renal and cerebrovascular diseases, as well as any other medical problems (for example, thyroid disease, Cushing's disease, systemic lupus erythematosus). In women, the date of their last menstrual cycle is determined. First of all, the presence of dysfunction in the target organs is estimated. Blood pressure should be measured not only in the lying position on the back, but also in a standing position. Also measured on both forearms. When determining a significant difference in measurements, aortic rupture may be suspected. Hypertensive crises are diagnosed if systolic blood pressure is determined above 180 mm Hg. Art. or diastolic blood pressure greater than 120 mm Hg. Art. In the retinal examination, new hemorrhages, exudates or papillomas can be detected, and hypertensive crisis is also confirmed. In the presence of heart failure, there is a jugular venous bloating, fractures with auscultation and peripheral edema. The results of a study of the central nervous system (CNS) may include changes in the level of consciousness and visual fields of the patient and / or the presence of focal neurological symptoms. Determine the level of electrolytes. 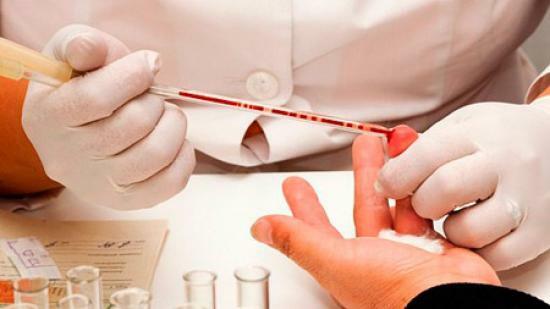 The level of urea nitrogen in the blood and the level of creatinine to assess renal insufficiency are measured. Urine analysis is performed to determine hematuria or proteinuria and microscopic analysis of urine for the detection of red blood cells. A general analysis of blood and a smear of peripheral blood is made, which makes it possible to exclude microangiopathic anemia. If necessary, the concentration of thyroid hormones is determined and other endocrine studies are performed. If there is a suspicion of pulmonary edema or the patient has chest pain, chest x-ray and electrocardiography are done. Patients with neurological signs should be evaluated using computed tomography or magnetic resonance imaging. 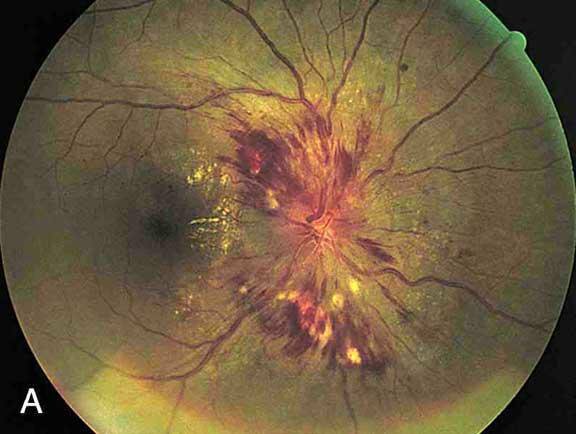 In the malignant course of GC, ophthalmoscopy is mandatory and in such cases the patient is identified by the papilledema retina (as in the photo below). Additionally, eye swelling of the optic nerve is often observed. Hypertensive crisis can be treated by hospitalization with the further use of oral or intravenous drugs. In the absence of antihypertensive drug therapy, the average survival rate is 10.4 months. Fast and immediate reduction of blood pressure, usually within 5-10 minutes, especially when determining the dissection of the aorta. Blood pressure reductions are performed with beta-blockers. If the drugs are ineffective, then vasodilators, which are given intravenously, are used. Target blood pressure is less than 140/90 mm Hg. in patients with acute myocardial infarction or unstable angina who have no hemodynamic disorders. When combining GC with pulmonary edema, nitroprusside, nitroglycerin, with the exception of beta-blockers is used. The drugs of choice in treating patients with GK and acute renal failure are clotidipine, phenoldopam and nicardipine. Drug selection in the treatment of patients with hypertensive crisis and eclampsia or preeclampsia are hydralazine, labetalol and nicardipine. Blood pressure in the GC decreases gradually. For the first hour - about 25%, for the next 6 hours, the blood pressure should be reduced to 160/100 mm. ht Art. In the next 24-48 hours, blood pressure is brought to normal. Hypertensive crisis in pregnant women should be treated immediately to prevent the development of severe complications. Women with hypertension who have become pregnant or are planning to become pregnant should take methyldopa, nifedipine and / or labetalol during pregnancy. However, they should not be treated with ACE inhibitors, angiotensin receptor blockers, or direct renin inhibitors. Gradual decrease of blood pressure is crucial for the prevention of cerebral ischemia as a result of auto-regulation mechanisms. Adults with hypertensive crisis should undergo treatment in the intensive care unit, where continuous monitoring of blood pressure and damage to the target organs are carried out. Parenteral administration of the appropriate medications is also carried out. Adults with severe complications of the GC (for example, dissection of the aorta, severe pre-eclampsia or eclampsia, exacerbation of the pheochromocytoma), the blood pressure decreases below the usual - less than 140 mm Hg. Art. during the first hour and less than 120 mm Hg. Art. at the dissection of the aorta. Adults without severe condition, but with GK, blood pressure decreases to 25% during the first hour. If the patient is clinically stable, the blood pressure drops to 160/100 -110 mm Hg. within the next 2-6 hours, and then gently until normal for the next 24-48 hours. Long-term prognosis for patients with frequent hypertensive crises is defined as unfavorable. Mostly short-term death comes from severe damage to the nervous system. Also complications in the form of cardiovascular diseases, which lead to death during the next 12 months, are often determined. 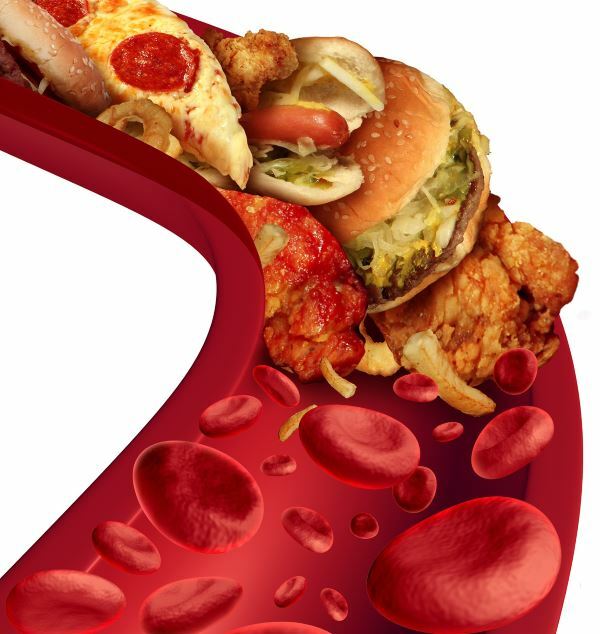 Hyperlipidemia - Keep the lipid profile within normal limits. Uncontrolled Diabetes - It is important to perform medical treatments to prevent progression of the disease. Omissions of antihypertensive drugs - it is necessary to adhere to the dosages and multiplicity of taking drugs that help control blood pressure. Older age is another factor that contributes to the development of GC, but it is virtually impossible to influence it. An important factor in the prevention of GC is the extensive training of patients with hypertension on issues of content within the permissible weight. For this, a special diet is most often used. Also, the doctor, if necessary, is prescribed exercises for the prevention of diabetes mellitus, high blood pressure, cardiovascular diseases and hyperlipidemia. All these medical conditions are closely interconnected, their balance must be maintained.Particular attention should be paid to compliance with medical procedures for the prevention of stroke and cardiovascular disease.